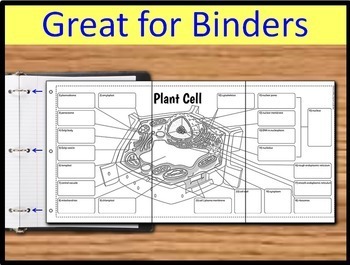 Plant cell interactive notebook foldable. 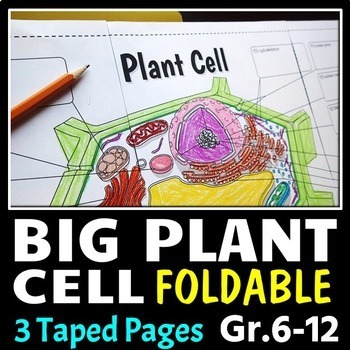 This big plant cell foldable will get your students excited about learning about cells! 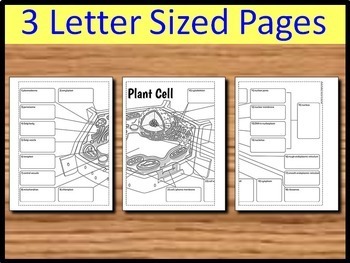 Students will be able to record all the descriptions of the structures in one large graphic organizer (made up of 3 taped letter-sized pages). This large format provides: 1) enough room to record descriptions 2) a clear and fun diagram to color 3) an excellent foldable to use as an all-in-one study guide. I drew and designed the image using Adobe Illustrator so it would stay crisp when blown up to a large size for the foldable. A great addition to this foldable is the Big Animal Cell Foldable. 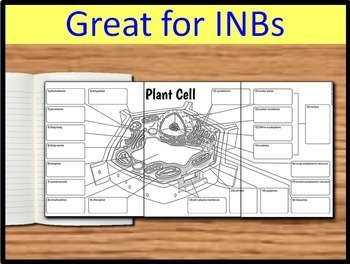 This is a superior diagram: I have often been frustrated with diagrams of plant cells that are incomplete. Many plant cell diagrams do not include amyloplasts or plasmodesma. This foldable has them all! BONUS: The clarity of all the rendered parts also makes the diagram perfect for coloring. The foldable is created by taping together 3 pieces of 8.5"x11" of paper with Parts 1-3 of the foldable printed on them. This can then either be 1) glued into an interactive notebook or 2) three hole punched and put into a binder. 6 different foldable options are provided for differentiation. See the PREVIEW to look at all the options. It comes with an answer key and instructions for assembly. ► Big Biology Foldables MEGA Bundle for 40% OFF. (1) View this assembled foldable on YouTube. (2) Click the PREVIEW for a closer look at this foldable and the options for differentiation. Students love that the diagram is large and that they can easily record all of their descriptions in one place. It is refreshing to use a graphic organizer that is so big and easy to see. It can also be a coloring activity for further reinforcement. When the foldable is complete, students can use it as a very handy review tool and study guide before any evaluation. Some teachers have told me that they even display them in their classes as student posters when the students are done! CHECK OUT ALL OF THE BIG FOLDABLES! ✿ More Big Foldables will be added including the Immune System and Cellular Respiration/Photosynthesis. Follow me to get updated about when these products are available in my store.